This special feature article was contributed by Denzil Ford, Ph.D. – Writer & Content Strategist at MediaValet. Less than a year ago, I had a phone call with a PR executive in the manufacturing and distribution sector who prided her team on their progressive public relations strategy. We were discussing the development (and innovation, really) of a set of projects, and I had noticed that their social media efforts left something to be desired. So I asked her: “Do you envision any changes in the future for your social campaigns?” What had been quite a spirited conversation about business growth through building relationships with their expanding youthful customer base quickly turned into a somewhat sharp lecture about one thing: the incredible risks associated with any significant participation in social media for the manufacturing and distribution sector. Her change in demeanor shocked me a little, and I’ve carried that moment with me thinking that there must be something much deeper going on here. My previous background as a historian who managed thousands of photo, video and audio files and wrote about the history of science and technology (and sometimes computers) continually gets me thinking about the various underlying aspects of DAM. In recent years there has undoubtedly been a growth in demand for social media technology and solutions across many sectors. What isn’t spoken about as much in the land of blogs – where authors mostly want to tell you how you can win the social game in 3 easy steps – is that there are a set of not-so-obvious, but very common and incredibly complex anxieties that exists alongside those increases in demand. In regards to social media, the PR executive I spoke with on the phone was not wrong: risks of all kinds for business in social media are aplenty. In just one click, a single employee can create a brand nightmare for the entire company. Almost daily, we see sincere damage from social media missteps. Last year alone, Blackberry, Clorox, Bic, the Houston Rockets, and Starbucks came under heavy fire from tweets in which an employee accidentally or haphazardly promoted a competitor’s product, relayed racist or sexist comments, and one even made an emoji joke in which a horse was being shot with a gun. Sometimes companies don’t even have to say anything at all to come under attack. SeaWorld and MacDonald’s had their well-intended hashtags hijacked by public Twitter followers who used them to create conversation around intense criticisms of company practices. What I hope for here on the DAM News platform is to become part of more conversations amongst DAM professionals at all levels. Where are we now? Where have we been? And where are we going? There is a lot to be learned by continually contemplating the answers to those 3 questions. In this article, I’d like to post an update to DAM News’ last full-length discussion of social media + DAM from 2013 by briefly considering where we have been, where we are now, and where we might be going. Part 2. How to use DAM to manage media distribution across social media channels. What struck me about the series was the level of attention to some of the “threats” social media can pose to organizations who engage in it. I was intrigued because these aren’t the kinds of threats we (marketers for sure but also more public audiences) tend to think about when talking about social media, but they are incredibly important. More often, businesses fear the very public side of social media hiccups and disasters that result in outward damage to their brand. Even in the absence of significant negative events, these fears are realized as worry over saying or visualizing the wrong thing on public social media that offends the community of constituents or the public at large. Yet, these issues around managing digital assets for social media – lost or wrongly placed visual media files – seem to signal a fundamental point at which things can go wrong long before the public gets involved. Turns out, people doing social media for businesses have anxiety about not just the result of social media, but the process of making the actual posts. Ralph’s article series discussed many issues, but on one important level it brought out some of those anxieties and described how a DAM can help alleviate them. DAM systems have been helping businesses manage their social media, and by nature this has, for several years at least, required the inclusion of rich visual media. But using a DAM directly for this purpose presents some very real and potentially damaging challenges. If employees remove assets from the DAM system, the ability to track them diminishes quickly. Sometimes, due to a lack of care or awareness, someone could upload company assets directly to social media platforms, completely cutting off any ability to track them. In addition, employees still have the ability to add messages to approved media that do not align with company values or messaging. All of these situations boil down to control, or rather a lack thereof, over the process of managing digital assets for social media posts, of company collateral, such as images and essentially control over the brand. As Ralph’s essay described, all of these issues have the potential to be dealt with from a DAM system, of course considering a few limitations. The way this has been done is by integrating the DAM directly with the social media platforms. Ultimately, DAM systems have been used as centralized systems that track (with some limitations) digital assets being pushed out on social media channels. As time has passed over the last 5 to 7 years, there have been many other developments involving social media that involved digital assets. Most notably, social media management tools evolved with increased functionality to allow users to create social media post with rich visuals, “manage” the posting of those materials, and utilize analytics towards understanding ROI. 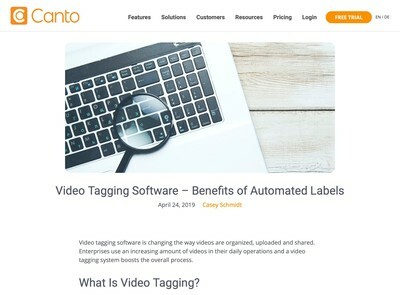 Businesses have been opening up to the idea of adding yet another tool to their enterprise toolbox that makes it easier to keep track of their company’s social media activity. Most of us are familiar with the concept: from a single dashboard, teams can create, organize and schedule social media posts across multiple platforms, tailor content to each platform’s audience and tone while maintaining brand consistency, and even schedule items to be posted in the future. What I’m discussing here is the idea that a company has an account with a social media management tool, but the individual employees can also have accounts with that same tool. When that is the case, the designated admin can invite other individual users to the company’s account from which these users will have access to all the (allowed) features associated with the company’s account. This opens up huge potential for teams to participate in social media for business together, but also with their unique personal identities and valuable networks. The DAM system sort of just sits in the background and can be accessed from the DAM app when rich media are needed. Because assets are being accessed from the social media management tool that is integrated with the DAM system, every use can be individually tracked and reported. Certain work flows are built in to the social media management tool, and where there is room for adjustments, teams can decide for themselves. But the key here is that having a social media management tool onboard as part of a company’s work flow process sets the expectation that social media for business will be conducted from that tool. The incentive to remove an asset from the DAM system decreases outside of pure negligence. Another benefit is company-wide cohesion. With a dedicated company social media management tool, a social media management policy will make a lot of sense, especially if there isn’t one in place already. A formal policy is going to protect your company’s reputation, minimize confusion at all levels from work processes to potential legal missteps. Perhaps most powerfully, a set of clear guidelines on how employees should approach social media for work purposes will help the organization as a whole understand how they can help as individual workers to build brand awareness. A policy gives defined action items and advice on commenting and posting. Vendors are just starting to make this functionality available so options of which social media management tool a DAM can be linked to are still limited. Anytime a user removes a digital asset from the DAM system, trackability will be lost. Ultimately, anyone who really wants to can remove an asset and place it on their desktop where it could become outdated. They could then go straight to that asset the next time they make a social media post. But I argue that the incentive to do this is lessened when a DAM system is integrated directly into the social media management tool. The incentive is less, except in extenuating circumstances. Another threat Ralph discussed in 2013 was employees who “do not realise or do not care” about proper usage of your company’s media assets. The threat is that they can upload unapproved or inappropriate assets to their own social media channels. The negative potential has grown alongside a particular marketing practice that is increasingly appealing. Basically, businesses ask employees to post to their personal networks with the knowledge that company messages will be seen as coming from a trusted source and essentially reach many more potential leads than is possible directly from the company’s social media accounts. The problem is that this opens up a huge challenge. With employees posting to their personal accounts, assets leave the auspices of the company’s tracking capabilities. Asset usage can be lost or they can become available to third parties who end up using them without any reference to the original source, which is your company’s brand and message. But as I stated above, with a social media management tool in place and with a company-wide social media policy, it is likely going to take pure negligence or malicious intent for these issues to occur. There is little to be mitigated here besides hiring awesome and trustworthy employees, something I like to think companies strive for anyway. The Future: Technology or People? The overall shift here is that there is increasing movement away from the bulk of an organization working directly in the DAM system. 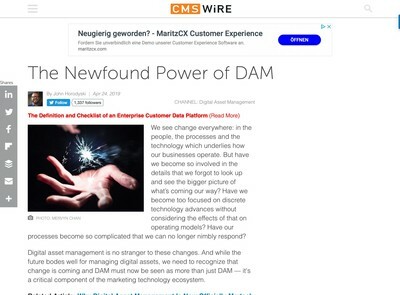 Instead, DAM administrators handle digital asset organization, metadata structures, and permissions and approvals while end users access the DAM system directly from within the tools they are already using. Sweeping claims about the future of DAM technology or the industry as a whole make me uncomfortable. What I notice, however, is in regards to social media. The needs businesses seem to continually have, no matter what solution-of-the-day developers come up with, involve avoiding or mitigating public relations risk. Empowering employees company-wide with access to a DAM system from a social media management tool seems like it takes another step further towards decreasing those risks and eliminating fears of conducting certain aspects of business on social media. 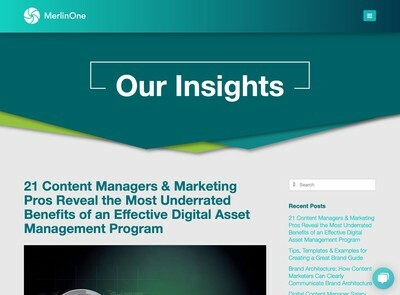 But if the DAM industry is going to continue to perfect the ability to meet the needs of its customers who have a constant desire to minimize social media risks, where will this layer of digital asset management tied to social media lead? I pose the question because the companies I mentioned at the beginning of this essay that experienced social media disasters most certainly use some sort of social media management tool (a fair educated guess), and they make posts that have rich visual media so they obviously use some method of managing their digital assets. Thus, a management tool (or set of tools) alone does not end all risk, and I think it is safe to assume that a DAM-integrated social media management tool also would not in and of itself eliminate all risk, even though that is the most primal need of a company who has committed to a social media strategy. The wild card here is human beings. First, the people making the posts and second, the people receiving and interpreting not just social media content but all of any business’s activities and philosophies. As a historian turned content marketer, I sit at a curious intersection where I wonder what’s next in regards to this particular entanglement of human beings and technology. 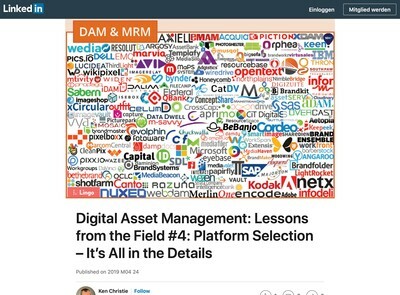 Ralph advocates that the future of DAM is likely going to involve “modularisation” and flexibility that develops out of consumer’s insatiable appetite for greater choice when managing their digital assets. Several other DAM experts either agree with him or hold visions of the future that more or less align with that viewpoint. The funny thing is that I keep coming back to the people, not the technology. For social media, the risk we are talking about here is some employee making an all too human mistake. Someone has an insensitive moment and posts something with a sharp edge that hits the audience wrong. Or a joke seems like a good idea, but doesn’t translate online. An employee has a lack of knowledge of what could be offensive to a particular sub-set of the company’s audience as a whole. The possibilities here are endless, but the catalyst is always human. It is presumptuous for us to assume that the solution is absolutely technological. So when we talk about the future of the DAM industry, the future of DAM technology, and the future of DAM vendor solutions or DAM vendors themselves, most of what I read tends to want to focus on the computer-related aspects. I just wonder if we should be having more conversations about the people. This is especially the case when discussing social media, which is by nature “social” and fundamentally human. It is only through engaging people in meaningful and thoughtful conversations that everyone comes out with new knowledge and perhaps a more extensive perspective. So please, join in this conversation with me. Where do you see the future? Will DAM technology evolve to be capable of saving us all from social media blunders? How? Or will human unpredictability always catalyze the unknown? What do you think is next? Author: Denzil Ford, Ph.D. – Writer & Content Strategist at MediaValet. “The wild card here is human beings.” – you said it yourself. DAMs can merely serve as tools to help people, they can help enforce brand standards, create appropriate renditions for different channels, track social media interaction, and they *might* guide humans to make fewer mistakes, but if there’s no risk there will be no reward, the power of the human touch is inevitably a double-edged sword. We will see DAMs enable larger-scale success with social media and larger-scale debacles as well.